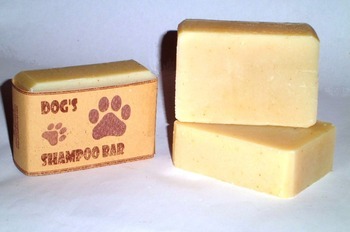 Dog's Shampoo bars are 100% natural handmade soaps for bathing your dog. The Shampoo Bar is handmade with olive, coconut, sunflower and canola oils as well as neem oil. All these ingredients will contribute terrific coat conditioning to the bar, leaving your dirty dog's coat silky and shining. We lightly scent our Dog Shampoo Bar with Lavender, Cedar, Lemongrass and Tea Tree essential oils to discourage any insects such as ticks or flies from irritating the dog. The handmade and hand cut natural soap is made by cold process and it consists of 100% pure ingredients without artificial colors, fragrances and preservatives.